The three-day National Youth Leadership Roundtable marked the collaborative effort to build a multifaith network of national allies to address teen dating violence. 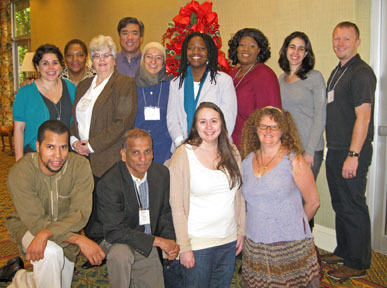 “Together we can do more than we can do alone,” said Sr. Eileen McCann, a participant of the National Youth Leadership Roundtable, December 5-7, 2010, in West Palm Beach, Florida. This sentiment was shared by the diverse group of faith leaders during the three-day roundtable to more effectively address teen exposure to domestic violence and teen relationship violence in faith communities. FaithTrust Institute gathered with representatives of many faith traditions to discuss and develop solutions to the issue of teen dating violence. “The roundtable only affirmed for me the critical need for faith leaders and communities of faith to be trained and equipped with the tools to support our youth and to work proactively to protect them as well,” said Waltrina Middleton, United Church of Christ Minister for Youth Advocacy and Leadership Formation. Participants left inspired and energized to continue working toward teen dating violence prevention. “I am most grateful and will bring these resources to bear both in my own faith community as well as in my teaching at the graduate level,” said Rodger Nishioka, Ph.D., Benton Family Associate Professor of Christian Education at Columbia Theological Seminary. Founded in 1977, FaithTrust Institute is a national, multifaith and multicultural training and education organization with global reach. FaithTrust Institute works to end sexual and domestic violence by providing religious leaders and advocates with the educational tools and knowledge they need to address the religious and cultural issues related to abuse. For more information, please visit www.faithtrustinstitute.org.